If that junk drawer of yours has gotten out of control recently, hang in there. There is a way you can gain control back and organize your drawer. Follow these simple steps below and you’ll be smiling at your savvy organized self in no time! First, empty the drawer onto a table. This way, you can see everything in there all at once. Wipe the inside of the empty drawer clean with a wet rag, or old sock, or whatever. Group like items together. Collect all the paper clips together, all the rubber bands together, all the batteries together, etc. Isolate items that don’t really belong in the junk drawer, and spend a few minutes to return those items to their proper location throughout the house. 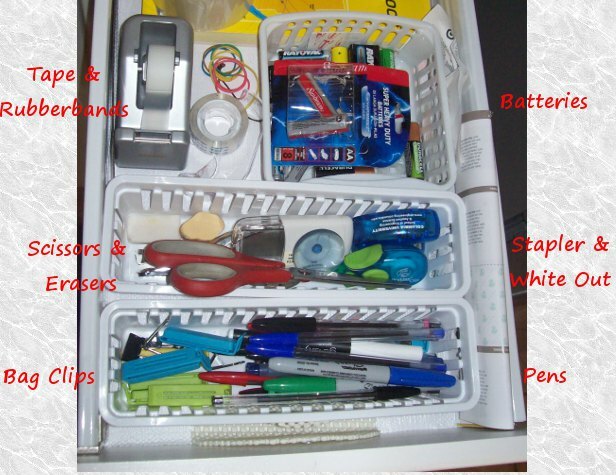 Buy some small plastic drawer dividers to compartmentalize your drawer. I found mine at the dollar store. You could also just use envelopes and bags, if you prefer. Put your like items together in one compartment, and repeat for all categories.